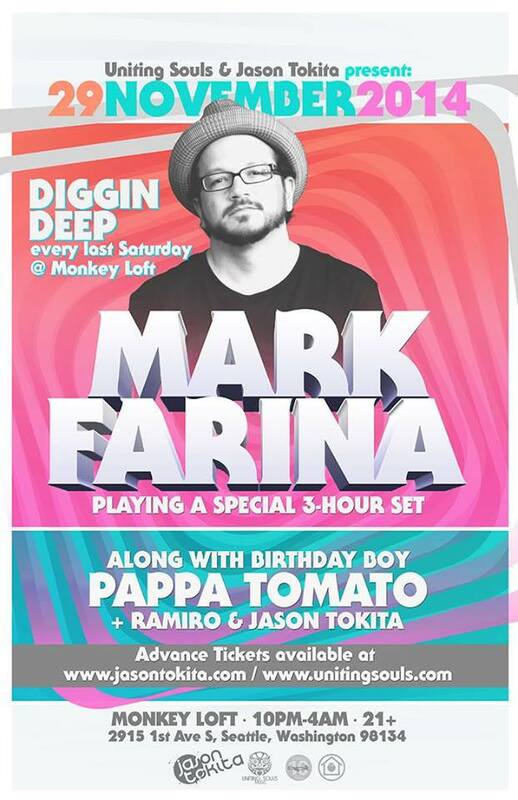 Uniting Souls Music and Jason Tokita present a special edition of DIGGIN’ DEEP at the Monkey Loft featuring house legend Mark Farina! Don’t miss this rare opportunity to catch a true house legend in such an intimate setting. Note that Mark will be playing a special 3 HOUR SET! Mark Farina – 3 hour set! 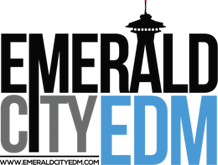 Don’t forget to stay up to date on local EDM events by following the EmeraldCityEDM Event Calendar. See you at the Monkey Loft! Biography: Modern day record minstrel, Mark Farina, has thrilled crowds globally, entertaining over 1 million fans per year. As one of the most ubiquitous DJs in Dance Music, Farina’s known for both his unique style of mixing Jazz, Downtempo and House Music as well as being the creator of Mushroom Jazz: West Coast jazzy, organic productions combined with East Coast Hip-Hop, Urban beats. Farina relocated to San Francisco in 1992. Fans embraced Mark’s downtempo style and he started co-hosting a weekly Mushroom Jazz club night in ‘93. In 3 short years, Farina established a fanatical, cult-like following for his Mushroom Jazz sound and in 1996, OM Records released the first mixed comp CD, simply titled, Mushroom Jazz. Since then, Mark has released 7 volumes of Mushroom Jazz with 2013 marking the 20th anniversary of the series. Other notable releases include OM’s Seasons, San Francisco Sessions Vol. 1, Connect, House of Om, Live in Tokyo, and Fabric 40. When Mark’s not touring the world, headlining festivals including Harbourlife (Sydney), Southport Weekender (UK), DEMF (Detroit), Coachella (CA) and T in the Park (Scotland), you’re likely to find him in his studio working on new releases or podcasts for his label, Great Lakes Audio. On days off he’ll be cruising his ’68 Toronado with his son, Dylan (aka “little peanut”), and his Yorkie, “Pumpkin”. Voted as one of the top DJ’s in the world by URB, MUZIK and BPM magazines, Mark Farina’s taste making skills continue to turn the heads of seasoned Dance Music veterans as well as newcomers to the scene.